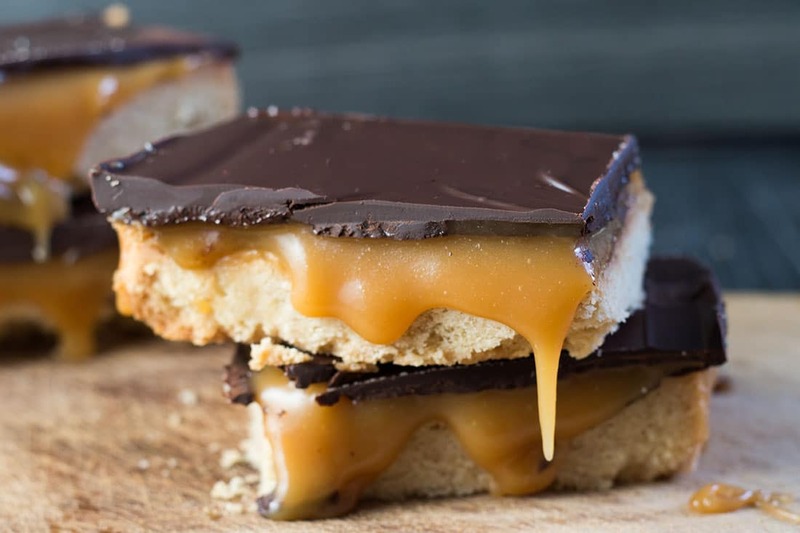 This popular shortbread dessert is in a league of its own with a salted caramel layer sandwiched between a shortbread base and dark chocolate topping. 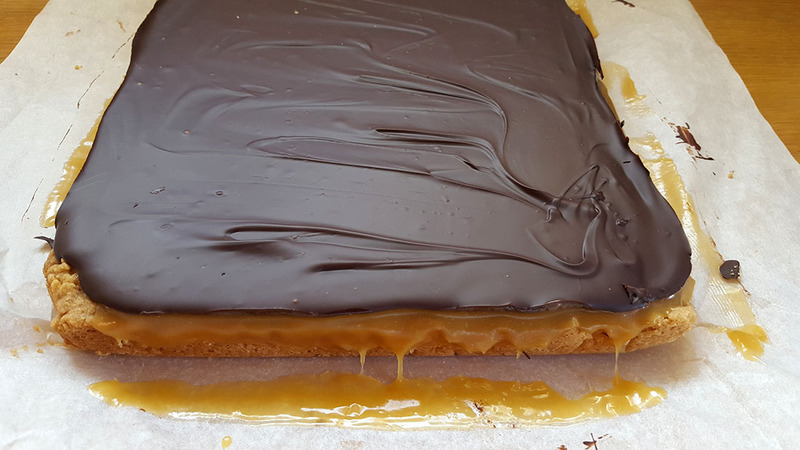 This recipe for Billionaire Shortbread has a crisp shortbread base with an indulgent salted caramel filling that’s topped with a layer of dark chocolate – pure heaven! 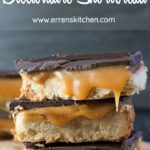 If you love millionaire shortbread than you have to try billionaire shortbread! 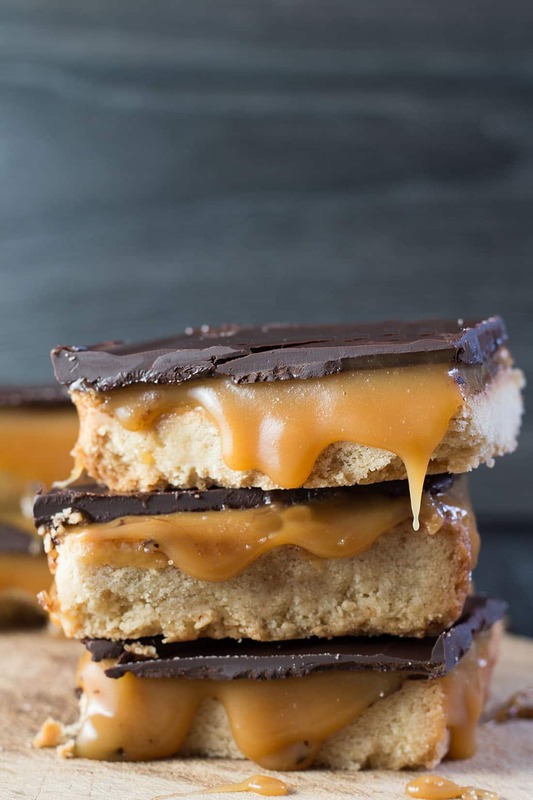 This popular shortbread bake is placed in a whole new league with the addition salted caramel. Once you try it, you’ll have to agree it’s one fantastic treat! I’ll be honest, before moving to England, I never heard of Billionaire Shortbread (or millionaire shortbread for that matter), but after my first taste, I was won over and it’s still one of my very favorite things in the world! I’ll never forget where I was the first time I tried Billionaire shortbread. It was on the train going to London for the very first time. My husband took me to a fantastic sandwich shop that’s near our local train station and that’s when I noticed them. The thick layer of shortbread followed by the caramel and chocolate was too much to resist! We added it to our order and I ate it on the train. I’ve been hooked ever since! To make them, you start with the shortbread base. 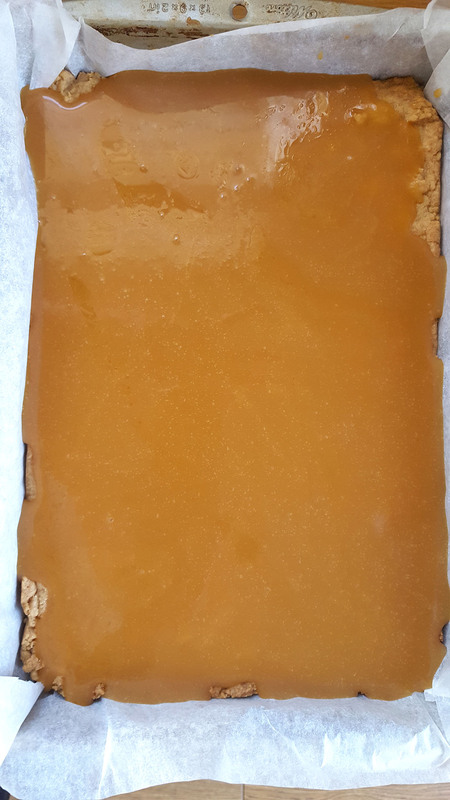 Followed by making the caramel and pouring it over the shortbread to cool and set. Once the caramel sets, you melt the chocolate. Carefully smooth the chocolate over the caramel. Leave to set completely before cutting or you’ll end up with the same beautiful, gooey mess I did! Serve and enjoy every last bite. Using a food processor or mixer fitted with the paddle attachment beat the butter, sugar, vanilla and brown sugar vigorously until pale and fluffy, about 3 minutes. It’s an important step to beat the butter and sugar well together when making shortbread as this ensures the shortbread is light, crisp and will hold together. Turn onto a floured surface and using floured hands, press evenly into the prepared pan (including the sides). Bake for 40 - 45 minutes, until lightly browned. Combine the sugar and syrup in a medium saucepan. Cook on medium heat, stirring constantly until it becomes a light caramel color. Add the butter, salt & milk stir until smooth. Remove from heat and mix in the vanilla. Set aside to cool slightly, then pour over the cooled shortbread. Looks delicious but 4and 2/3 cup of flour seems a lot and in the ingredients for the caramel you have put milk instead of cream. Good, clear recipe to follow, but I like there to be equal quantities of caramel to chocolate, so next time I’m tripling the amount of caramel suggested here. 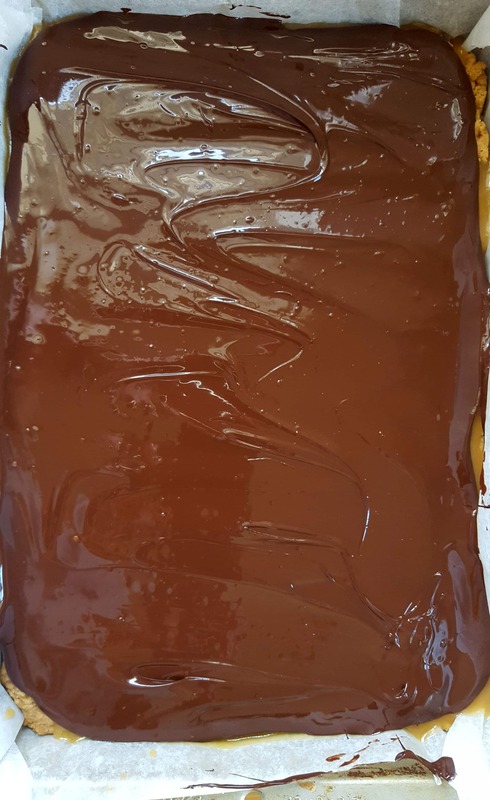 I tried this recipe and the caramel turned out well- albeit a bit runny. 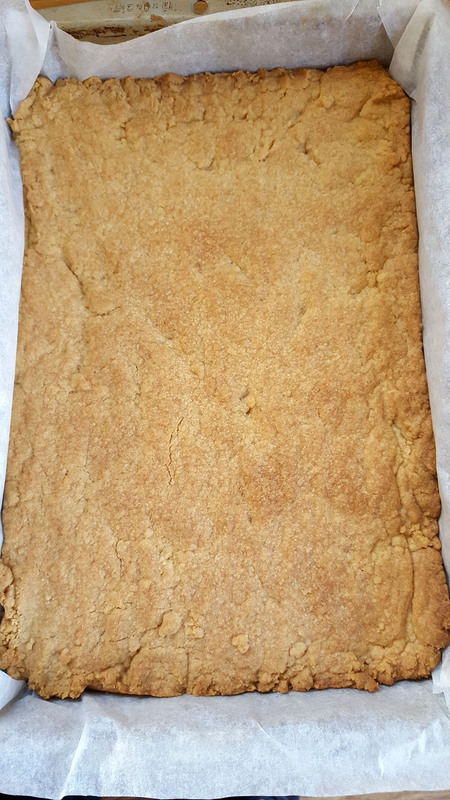 However, the shortbread did not turn out. It was much taller and thicker and drier than shortbread should be. Did you check the amounts on the American translation? 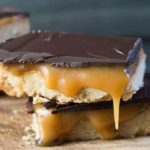 My kids love desserts with gooey caramel! They’re going to devour this one! Thanks so much, Sabrina! ? I don’t think these would last long at our house. Delicious!! They certainly went quick over here! ? 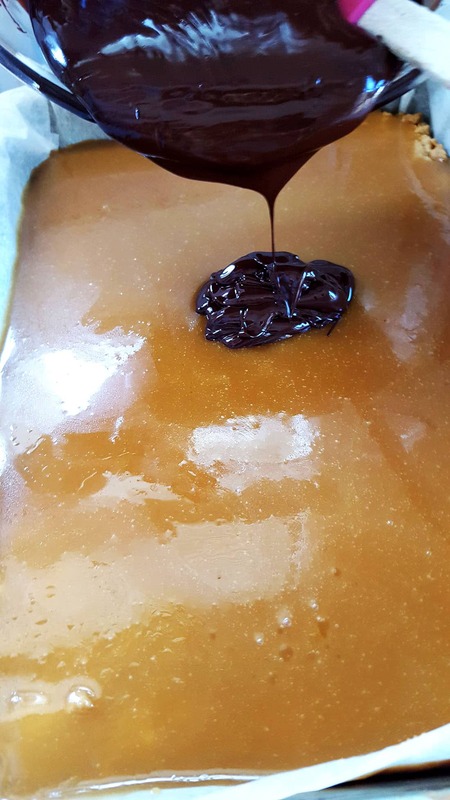 Oh MY….that gooey caramel! Amazing! Wow!! These are a lot easier than I expected. These seriously look so good. I’m so hungry right now lol!